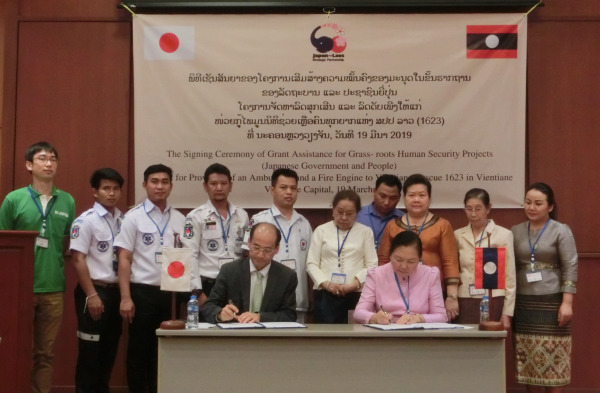 (KPL) The Japanese government has provided grant assistance worth USD 22,195 to Vientiane Rescue 1623, through its Grant Assistance for Grassroots Human Security Projects (GGP). The assistance was in the form of donation of a refurbished ambulance and a fire engine. 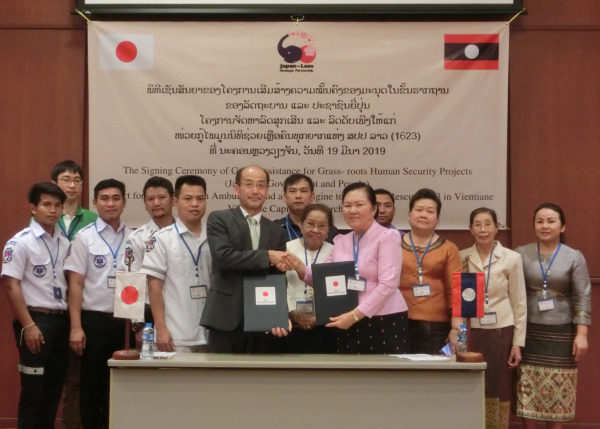 The signing ceremony for the project’s grant contract was held at the Japanese Embassy in Vientiane on Mar 19, 2019 between Mr. Kazuhiro Kuno, Minister of Japan to the Lao PDR, and Ms. Sisaliao Thammathewa, President of the Foundation for Assisting the Poor People of the Lao PDR (Vientiane Rescue 1623), and was witnessed by other officials concerned. Through this project, entitled “the Project for Provision of an Ambulance and a Fire Engine to Vientiane Rescue 1623 in Vientiane”, the Japanese government aims to assist Vientiane Rescue 1623 in improving their capacity to respond to life threatening situations, through the donation of a refurbished ambulance and fire engine which had been used by Japan’s local government. Recently, the need to improve the local emergency services is becoming apparent due to the increasing numbers of road accidents and incidents of fires in Vientiane. Established in 2010, Vientiane Rescue 1623 is a volunteer-run, charitable, non-profit, humanitarian organisation, comprising 370 volunteers, in four locations in Vientiane Capital. Its services started with a free 24 hour, 7 day a week, ambulance service and it has responded to over 8,000 emergency calls, including vehicle accidents, incidents of fire, and many other life threatening situations.